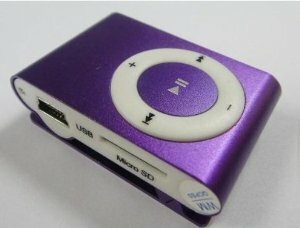 Purple Mini Clip-on MP3 Player Only $5.10 w/ FREE Shipping! UPDATE: Look on right side of page under "More Buying Choices" to find this low price! Hurry over to Amazon to pick up a Purple Mini Clip-on MP3 Player for only $5.10 shipped! I understand that this may not be the best quality player, but it may be good for a young child or to test a tween or teenager's responsibility skills before buying a more expensive one! TIP: If you scroll down the product page a bit, you'll see different colored MP3 players at varying, but still low, prices!